A perennial favorite, Colleen First will now share her trip from this summer of '07 to the Dakotas and back. This fall we'll be breaking this article up into four parts so you have a little time to ride in between. As usual, it was raining when I started out on this trip. The sky was low with clouds and the air thick with humidity. Cool temperatures led me to bundle up early and I rolled the GS out of the garage for the first leg of what would be a 9-day journey to Custer, South Dakota, for a motorcycle meet and then back home to Seattle. A quick dash through town and I was on I-90 for a few short miles to North Bend, where I planned to meet up with two other riders. I was early and sat down under a tree to wait for the first arrival, camera in hand. Chris was the first one to roll into the parking lot and I snapped his picture as he neared me. We went inside to wait for the other rider, who's name is also Chris. Because of the confusion this creates, I call each of them by their screen name on STN. Cheez, the first Chris to show up, and I had a light breakfast and talked for a while until Req, the second Chris, could finally make his way to North Bend. Req had run into some trouble getting his new Olympia riding suit delivered in time for the ride and was delayed in retrieving it from the UPS holding facility in Redmond, Washington. But we were finally together and ready to go, only an hour later than planned. The first order of business was to get over the Cascades. I felt confident that once we got over the mountainous barrier that the sky would clear up and the sun would come out to play. So we trudged up I-90 through a light mist and came down the other side still in a light mist. Not one to pass up an opportunity for fun, I took us over Blewett Pass, enjoying the brief 40 miles of curves and close mountains. The clouds persisted even as we dropped down into the Okanogan valley near Wenatchee but I held onto the hope that riding a little further north or east would clear things up right away. We took the same route that I had taken to Grand Coulee Dam the previous month, enjoying yet again the wide-open spaces of Washington's interior. I toyed with the idea of skirting over to Wilber and taking the Keller ferry across the Columbia River but I was interested in taking a particular road north of the river. I should have taken the ferry, but the original route was still enjoyable. Despite the wet conditions. The weather held for our dash up #21, following the Sanpoil River and enjoying the farmlands along the way. It didn't take long to cross the border at Danville and then we were safe on Canadian soil. I led Chris and Chris through Grand Forks, noting that the town's tough bicycle gang was out in full force, the four riders pedaling down the sidewalk with gusto. Shortly after Grand Forks I saw a single headlight heading my way. Something about it looked familiar and I wasn't too surprised to see Jim, another STNer, waving at me as he went by. He had been itching for a ride and decided to come out and meet us. 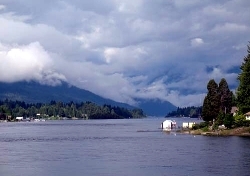 He caught up with us and led us back to Castlegar, where we were planning on spending the night at his house. Dinner awaited with fresh burgers off the grill and cold beverages from the fridge. Req took some time to check out his new riding gear while in the comfort and dryness of Jim's living room while Jim and his family relaxed with us. Another friend, John, dropped by to say hi and the hours passed by pleasantly. Plans for the morning were made and eventually we stumbled off to our beds for the night. The next morning dawned damp and overcast, but not actively raining. Jim was going to ride with us for a few hours that day and we started by heading north to Balfour where we were just in time to catch the Kootenay Ferry across the lake. It was a relaxing 30 minute ride across the water with clouds hanging low over the water but the sun still managing to lighten things up in a cheery sort of way. What was even more cheerful was the prospect of #3A that awaited us. This is Destination Highway's #1 ranked motorcycle road in all of BC. I don't think it deserves that high of a ranking, but that doesn't mean that I don't enjoy a good romp down its pavement now and again. The road did not disappoint and even managed to dry out for long stretches at a time. I lead us at a decent pace, but Cheez quickly took over and let it be known that he was the fastest rider in the group. A quick photo-op near the south end of Kootenay Lake grouped us up again and then we were together rolling through Creston and points east. From Creston, the #3 rolls quietly through the softer hills that are tucked between the Kootenays and the Canadian Rockies. 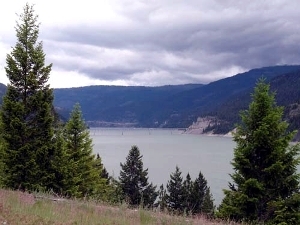 The clouds continued to haunt us and eventually the rain caught up to us (or we caught up to the rain) near Moyie. Jim pulled off to the side so he could put his rain gear on. Traffic was getting thicker the further east we went and I looked sadly at the RVs and campers that drove by, knowing how hard it was to pass them before and I'd have to do it again. The road beckoned and soon we were back on our seats and playing in the weekend traffic. A few more elevation changes and we came to the town of Cranbrook. I was charged with finding lunch but failed miserably. The couple of places we stopped at were closed (it being Sunday) and finally we resorted to asking a local. They made a suggestion that was just down the street and somehow between getting on the bikes and pulling out of the parking lot, I lost the rest of the guys. I also got lost getting to the suggested eatery but with some more help from the locals I eventually found the place and parked the bike. No one else from my group was there so I sat down to wait. Eventually Jim rode up and let me know that they had found another place, which was good, because I had been sitting in front of what was essentially a coffee shop � not exactly "lunch" material. A quick trip down the block, around a few more blocks and then up another block found Cheez and Req waiting outside a suitable looking diner. The key to this building's acceptability was the sheer number of pickup trucks parked out front � a sure sign of good food inside. And the food was good, although the service was a little bit lacking as the server was caught alone and a lot of patrons came in around the same time. The highlight of the stop was a tie between Cheez trying to get a glass of water and Req trying to get into his riding gear with the liner in place. Shortly after leaving Cranbrook the rain returned in earnest and it was with a wet, heavy heart that Jim pulled off near Elko to turn around and head back home. We said our goodbyes while standing in the puddles of the turn out and then headed south for the border. The border guard was repetitious in his questions to us, asking us no less than three times if we had anything to declare or if we had any firearms or tobacco. After making me open up one of my side bags he finally seemed satisfied and let us cross over into Montana. A few short miles later we were fueling up in Eureka and making plans for the next portion of the day's ride. 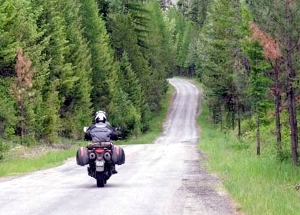 Jim had told me about Koocanusa Lake, a little-known lake just east of the Montana/Idaho border that was ringed by motorcycle-friendly pavement. We would make our own way down to the south end of the lake and then meander south and east until we decided to stop for the evening. The plan being set, we headed for the lake. A long bridge marks the choice between routes. The east side is fast, full of sweepers and high-speed corners. The west side is the opposite with tight turns and a correspondingly slower pace. I chose to go for the west side, hoping that there would be less traffic and more fun. The roads were wet which in of itself wasn't a problem, but the surface was covered with "tar snakes" � those strips of tar that the state puts down to cover up cracks. These are deadly slippery when wet or very hot, and today was a wet day. The road was so bad, in fact, that Cheez turned around to take the faster east side route while Req and I continued to slide our way through the corners. It was worth it. After a few miles the tar snakes cleared up and the surface dried out and I was railing through the corners like no one's business. I saw more bicycle riders than I did cars and only two deer cared to come out to bother me. I stopped frequently for pictures, occasionally catching Req as he flew past and then mentally waved as I passed him further on down the road. The tar snakes returned towards the end of the road but a sufficient number of corners had been conquered so that I did not feel entirely cheated. After a brief confusion on finding our route, Req and I met up with Cheez and together we took off down Fisher River Road and points east. Fisher River Road started out as fairly unremarkable and desolate. The river and the railroad followed along to my left and trees dotted the hillside to my right. There was no commercial enterprise here, or any residential. From what I could tell, this was generally unused recreational land. Therefore it was no surprise that traffic was almost non-existent and the three of us were able to keep up a merry pace through the gently bending turns. Then the road took a dramatic swing to the right and left the river and the railroad behind. The road started to climb and get narrower. Eventually the painted lines disappeared altogether and edge of the road dropped down into a steep valley. I was seriously hoping that this would not be a well-traveled road. As it was, we encountered one truck coming our way but it was at an easy place to pass and we were left alone for the remainder of our route. When riding down a major road, I often look at the road signs tucked along the side, wondering where these passages lead to and what wonders might be found if I were to follow them. Fisher River Road is one of these, as it spit us out surreptitiously onto Hwy 2 and we joined the plebeian crowd of travelers yet again. Flathead Lake was surprisingly beautiful, with glacier-fed waters in the northern end offering a greenish hue to the surface. Houses and boats crowded the shoreline but in a pleasing picturesque sort of way. 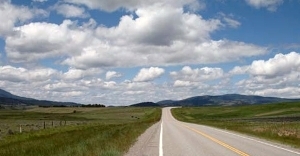 The road hugged the western shore of the lake and gave a variety of views and road conditions. This wasn't a very fast road and traffic was a little heavier than we had been used to, but we made good time and arrived in the rather dull town of Ronan. We found the stellar "Starlite Motel" at the end of the commercial strip and proceeded to bargain for a room for the night. The desk clerk was helpful, if not a little too talkative, but pointed out a nice place to eat a few miles down the road. We secured our room and took off for dinner before it got any later. I laughed when we pulled into the "restaurant" that the motel clerk had recommended. He had neglected to tell us that it was actually part of a lodge and we very well could have stayed there for the night. But the food was scrumptious, the waitress was a hoot and the view of the Rockies was spectacular. It was with a heavy heart that I could not eat the last two potato skins on the plate. But I did manage to create a pretty good imitation of Devil's Tower with my mashed potatoes, complete with broccoli trees at its base. Fun with food time was over and we got back on our bikes just as the sun was sinking behind the mountain range to the west. Cheez rode ahead to stop at the store while Req and I stopped at a scenic turnout, a sign that he had scoffed at on the way to dinner. But now, with the fiery red sun setting behind us, the mountains to the east were lit up with a mystical hue. The day's lingering rain clouds provided the second ingredient necessary for a rainbow that stretched down into the wetlands. But a warm room was calling and we made quick work of the last couple of miles back to the Starlite Motel. The next morning dawned bright and clear, a welcome change from the last couple of days. Cheez packed up his bike and Req and I bid him adieu as he road off to return to work and other bastions of responsibility. But Req and I had better plans. I had scoped out on the map a dirt road that would connect Rt 93 with Rt 83 and we were both excited to check it out. Req rides a V-Strom and had ridden with me back from California a few weeks back, enjoying the brief stint of dirt roads we had found then. More dirt could only be better! I studied the map and figured that the road I was looking for would have a sign along the highway. We rode south and then hit construction. Miles and miles of one-lane construction with gravel � this was not the dirt road experience I was looking for. By the time the construction ended I realized that I had not seen the sign I was looking for. Instead of backtracking through the construction hell, I saw that another dirt road would start a little further south from us and join up with the original road. It was time for Plan B. Nearing the tiny town of Arlee I once again kept a careful eye out for a likely-looking sign. Almost too late to make the turn I saw what might be what I was looking for. We made the turn and proceeded down an arrow-straight paved road that ran behind houses, pastures and parking lots. Not exactly what I would consider an auspicious start to a dirt road adventure. And just as suddenly as the road had come upon me, it took a wild swing to the left and became dirt. Potholes and all, this was the dirt road we had been looking for and I now knew it was called "Jacko Road." Req and I took turns again leapfrogging as we stopped for photos that interested us and then caught up with the other further down the road. It's a good way to travel as you're not hindered by what the other rider wants to do but you can count on someone being around to come back and help you if something does go wrong. 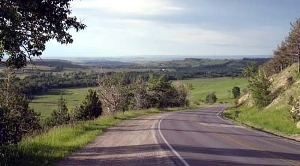 Jacko Road started out low in a narrow river valley with lush green pastures surrounding old rustic buildings. The views were limited by the thick trees and tall mountains around us, something that wouldn't change much over the course of this road. But soon we found that we were gaining elevation and the views became a little broader as we could look down on the valley below, including man-made lakes and beaver dam marshes. An odd waterwheel contraption caught my eye and I stopped for a closer inspection. Neither Req nor I could figure out its purpose. It appeared to be diverting water from the main river but I couldn't see where it would go. A fish ladder to one side allowed for nature to take its course as well as it could, but the natural flow of the river seemed stunted to a certain degree. Confounded by the waterworks, I gave up and continued to ride east along the narrow and winding road. Eventually a ranch or two would appear along side the dirt and shortly after that vacation homes made their appearance. We were entering the recreation area of Seeley Lake and the civilization that goes along with such places. A quick stop at the junction of 83 and 200 gave us a chance to quench our thirsts and my Reese's Cup supply. Now it was back to pavement and covering as many miles as possible before the close of the day. Tomorrow we were to cross over Beartooth Pass and I wanted to be as close as possible in preparation of an early morning assault. After lunch it was more open road and rolling hills. At the junction of Townsend, we were almost immediately blessed with a tight canyon and the corresponding wall-hugging pavement. Unfortunately with that blessing came a curse: an old couple in a non-descript sedan who felt that the speed limit was much too high. After a couple of frustrating miles (as well as building up quite a parade behind us) I pulled off to let the clowns get ahead for a while, only to find that the curves ended shortly thereafter. We caught up to the slowpokes, passed them this time and then ducked off the main road to take the lesser-used 294 through towns with names like Hamen and Lennep. 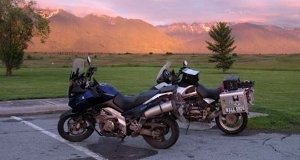 It was well worth the detour, as the road led through some beautiful landscapes and friendly locals waved back at us. We caught 12 again and took it as far as Harlowton, where fuel and more Reese's were finally obtained. Now we'd drop south for a while on 191, hopefully not fighting too much of a crosswind while we were at it. Instead of a crosswind, we found more construction. Miles and miles of freshly laid gravel awaited us, as well as a long line of single-lane "follow the leader" traffic. As a consolation prize, the Crazy Mountains kept my interest as they loomed larger and larger to the west. Eventually the gravel ended and the construction crew gave up and let us go. It was a short distance to I-90 and then a painful (albeit short) hop to our exit at Columbus, Montana. Planning to camp that night, Req and I hunted down the local Columbus grocery store to pick up fixings for dinner. This was really supposed to be a tight-budgeted trip and so far we had both failed miserably. Food secured to the bikes we headed south on 78, a road that was a complete unknown to me. I'm sure that someone must have mentioned it at some point in time, because the further we got from Columbus the better the road got. At first there was more construction (apparently half the state of Montana is under construction this summer) but then the road was unobstructed and we were left alone in rolling hills with the Beartooth Mountain range looming to the south. As it has been every time I've seen this range, there were dark, angry looking clouds hovering above it. But I didn't fear for the weather: the wind was blowing favorably and we were headed in a slightly different direction. As the mountains drew nearer, the views became more spectacular, combining with a late-day showing of the sun and thick clouds to bounce the light back. The road required a bit of speed to properly enjoy the curves at this point and with the late hour, Req and I were only too happy to oblige. This road choice was actually a mistake I made when we left Columbus. I had misread my map and thought that we should be taking 212, which was further to the east, but I had missed the turn off and chose instead to just stick with 78. I'm very glad I did. After almost 50 miles of pure joy we found ourselves in Red Lodge, Montana, ready to find a place to pitch our tents for the evening. Rolling slowly through the town, I was struck by its picturesque buildings and quaint aura. It vaguely reminded me of Jackson Hole, but in a much smaller, less trendy sort of way. There were plenty of cruisers parked along the main drag and a small brass band was playing in a park. People strolled up and down the sidewalks taking in the evening air. It was all very pleasant and when Req and I found ourselves rolling out the other end of town I pulled over to offer a suggestion. I knew that we were supposed to be camping, but wouldn't it be fun to find an old hotel in downtown and spend the rest of the evening enjoying the atmosphere? Req agreed and we rolled back up Broadway, the main street. I stopped at The Pollard, which looked to be the oldest hotel in the town and we went in to inquire about the rates. The high price didn't surprise me much, as the building was decked out with brass rails and ornate woodwork and had a delicious looking restaurant inside. Now keen on the idea of staying in town Req and I checked out two more motels, these ones at the other end of town. Neither was near the budget price of "camping" so we declined both of them and took up the suggestion from one of the managers of finding a campground that was just "three miles down the road."